Step 1: Fill out the online trade-in form and let us know which watch you want to trade-in for which brand and model. The more information you can provide about your watch the more accurate and faster we’ll be able to give you a quote. If possible add pictures from all sides of the watch (front, back, left, right) and the Box and Warranty card if you have those. Choose the watch you want to upgrade to. If you don’t see it on our website that doesn’t mean we don’t have it. We might not have listed it yet or we probably can order it for you. Step 2: You receive a free quote from us, including the trade-in value and the value difference to the watch you want to upgrade to. Step 3: If you agree with our offer, you can send us your watch or bring it to our office in New Port Beach in person. If you send it, we will provide you with information how to do it safely. Step 4: Once we receive your watch, we will check it for authenticity and its condition. If the pictures you have send where current and showed the watch from all angles, we will not need to adjust our offer. 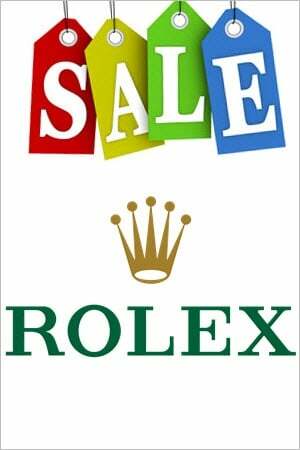 After checking your luxury watch, we will contact you and reconfirm our offer. Why should I Trade-in my Watch? 1) My watch is broken: Yes, we give you some value even for a broken Breitling, Rolex or Omega. You can use it to upgrade to a brand new luxury watch. Do you want to know how much you can get for your broken watch? Just fill out our request form and find out. Its free. 2) I want a better watch: Most people want to upgrade to a new or more expensive watch. Want to trade-in your Beitling for a Rolex? Upgrade from your Rolex Datejust to a Panerai? Switch from Rolex Submariner to Omega Seamaster or the other way around? 3) I want the newer model of my watch: Rolex and other luxury watch brands constantly improve their model lines. Naturally you might want to trade in your used older version or vintage watch for a brand new precision timepiece. Upgrading from a Rolex Explorer I to the new Explorer II makes a big difference on your wrist. 4) My ex gave me this watch and I want to trade it: You do not want to be reminded of your past relationship every time you check the time? Or maybe the timepiece did not fit your taste from the start. Then our trade-in program is perfect for you. Browse our shop and find a watch you like, or just sell the watch to us and receive cash for its true market value. 5) This watch is old and beat up: Vintage Rolex especially but also other luxury watch brands can have high collectors value. If you do not appreciate your watch any more maybe its best to check the trade-in value and get a brand new watch for it. 6) I like changing my watches: Collecting watches can be fun but expensive. If you do not wear your used Rolex watches after some time anyway, it makes more sense to trade it in for a new Panerai, Omega or any other luxury watch you desire. You have a special taste and can not find the watch you want in our shop? Let us know which watch you want and we will find it for you. 7) I’m trading my watches for the next level up: Are your friends teasing you because you only wear a basic Rolex? You want a watch with a higher price or more prestige? Then you can use your existing watch to lower the price for a Patek Philippe, Audemars Piguet or other high end luxury watch. Maybe you just want to upgrade from a Breitling to a Rolex or from a basic sports Rolex to a more elegent Rolex President Day-Date II dress-watch. 8) I’m just not wearing it anymore and want a watch I will wear: Whatever the reason you have to desire a different watch, our trade-in program gives you the best value. Getting a quote from us is absolutely free and nonbinding so you have nothing to loose. Find out your options and potentially get a great deal you would have never imagined. 9) I don’t want to go through the hassle of selling my watch to a private party: If you just want to sell, thats no problem. But if you want to use the money to buy a different watch anyway, the best deal is to do a trade-in. Even if you can not find the luxury watch you want in our shop, we will find it for you. These are just some of the reason’s why someone would trade-in their watch. You can trade-up or trade-down. If you want to trade-in at an aproximate equal value level our watch-experts can give you recommendations which brands and models might be interesting for you. Watch Trade-in Program benefits: - Get More Value Faster! Selling a watch is difficult enough as is, add to that you need to find the watch you want from a trusted seller at a great price. Why not get it all done in one quick, easy, hassle free place. At JazTime we give you an amazing full market value on many watch brands such as Rolex, Breitling, Cartier, Panerai, Omega, Audemars Piguet, Patek Philippe, IWC, Hublot, Jaeger Lecoultre, etc. Often times trading it in toward one of the watches that we have saves you money. You get higher money value with our trade-in program compared to selling and buying separately! Just like when you trade your car in to the dealer, when you trade in your watch you get more for it than if you were to simply sell it for cash to the dealer. That’s because when you trade it toward one of our watches we don’t have to put out our own cash and we can pass on that cost of capital onto you. We can trade in for almost any luxury watch you desire, even if it is not visible in our shop. Just let us know which watch you are looking for and we will get it for you. Which Watch Brands do accept for Trade-ins? In general we allow trade-ins of the following brands: Rolex, Breitling, Cartier, Panerai, Omega, Audemars Piguet, Patek Philippe, IWC, Hublot, Tudor, Tag Heuer, Jaeger Lecoultre. However, just because you don't see your brand listed above that doesn't mean we won't take it on trade. Whether its the cheapest Rolex Perpetual, a Vintage Rolex, the most expensive rare gold Rolex, or any swiss watch for that matter, try submitting the form above and try your luck, you never know! Sending a request is absolutely free. So you have nothing to loose. You are a Local Customer in Orange County, San Diego, or Los Angeles? We are located in Newport Beach in Orange County, California so if you're close to us you can even stop by make the trade in person. However we do ask that for all customers wanting to trade their swiss watch to fill out the form first so we can give you realistic expectations and an accurate quote. Luxury swiss watches is our speciality so the more information about your watch the better. Once you have submitted the webform above with detailed information about your luxury swiss watch we will review the information as quickly as possible then give you a quote. Usually we give you the quote within just a few hours if its during business hours. We get a lot of submissions each day so you'll be in the queue but if you can't wait that long give us a call directly and we'll work on your quote right over the phone with you.